Meriaura Ltd, a Finnish shipping company based in Turku, has received the first of two VG EcoCoaster newbuildings ordered from Royal Bodewes in Papenburg. They will operate in the Baltic region. Both ships are VG EcoCoasters. They are owned by Meriaura Group of which VG-Shipping is a part. Built to the ‘Cleanship’ class notation, the VG EcoCoasters, designed by Finland’s Foreship and Aker Arctic, are part of a fleet expansion programme to strengthen Meriaura Group’s position in the market for vessels of this class. VG EcoCoasters are designed to cause considerably less environmental impact than conventional dry cargo vessels. The hull and machinery of the 4.750 to (dtw) newbuildings are optimized to the speed of 10.5 knots in open water conditions while their dimension are of length 103 m, breadth is of 14 m at deck level and the draught is of 7.80 m.
The vessels propulsion arrangement has been optimised for slow steaming operations at speeds between 8 and 9 kn, although the main engine can attain a top speed of 10.5 kn in open water conditions. Power required for Ice Class 1A is achieved by a diesel electric driven unit. This reduction gear flanged generator works also as an electric motor (PTO / PTI). The aim is to almost halve the fuel consumption compared to conventional dry cargo vessels of similar type and size, and therefore also cut emissions remarkably. 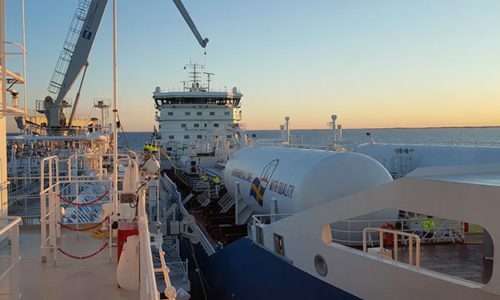 The vessels are powered by an ABC 8DZC dual-fuel engine each, capable of running on marine gas oil (MGO) and biofuel, which is produced at Meriaura Group’s refinery in Uusikaupunki. 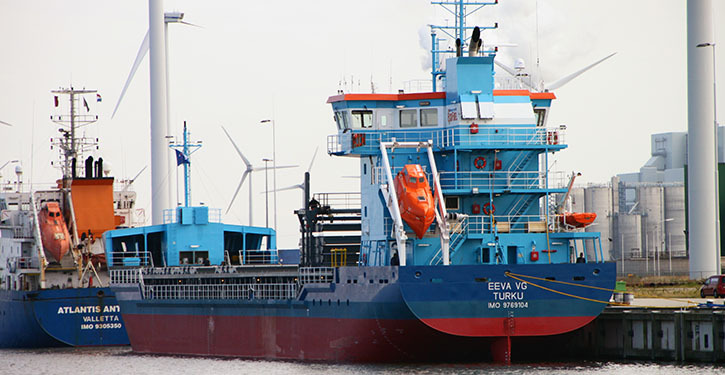 The vessels’ engines can run on pure biofuels or mixtures containing also traditional fuels. Acc to Meriaura Group the biofuel to be used can be almost any biofuel – “…however we have designed the system to use UCO, used cooking oil, which is treated and cleaned (UCOME = Used Cooking Oil Methlester) in our plant in Uusikaupunki. Our biofuels are produced from used cooking oils and animal residues. Because the burning of this fuel is somewhat slower, NOx is a bit higher. 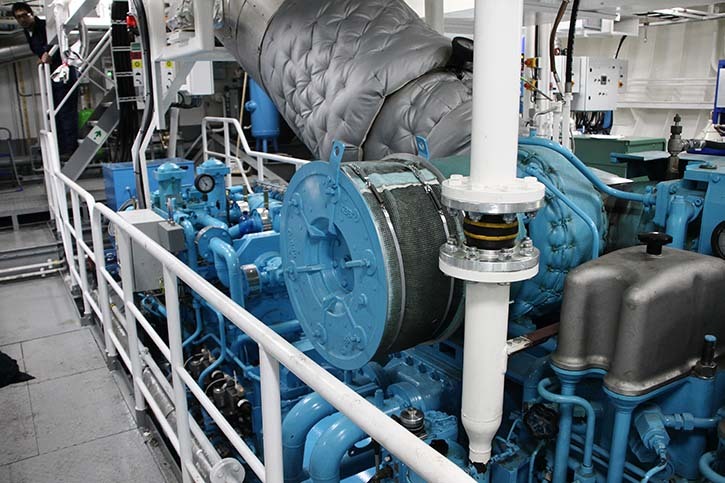 Therefore we install a catalyzer (SCR-system) for the main engine” says Ismo Saaros Director of the group and continuous: “The propulsion is up to 1.650 kW mechanically delivered from the main engine for open water, and for ice condition additional 834 kW from gensets with PTO/PTI generator/motor connected to the gearbox. 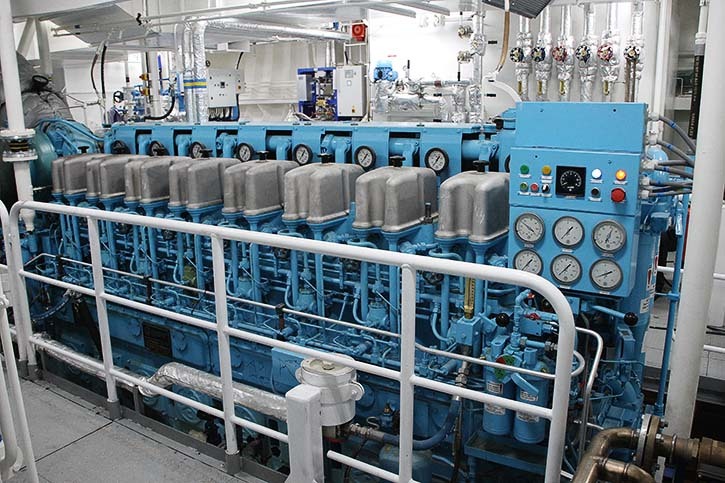 Gensets are 2 x 560 kW driven by 2 x 640 kW Mitsubishi engines. For the precise manoeuvring a bow thruster with 500kW electric has been installed. The advantage of using UCOME is the reduction of the greenhouse gas emission and the use of wastes and residues instead of mineral based fuels. Greenhouse gas emission savings compared to fossil diesel fuel is around eighty percent. This is an important contribution toward meeting the climate protection targets 2030 til 2050 and will be a cost relevant point. UCOME fuel cost will be somewhat higher, because of the actual lower fossil fuel prices. A second advantage in favour of UCOME is the reduction of the exhaust gas emissions. The emissions of hydrocarbons, polyaromatic hydrocarbons, SOx and CO2 are much lower than compared to HFO or MGO. Besides fuel economy and minimizing emissions, environmental issues have been taken into account in all possible ways. The new vessels will meet all the maritime environmental regulations coming into force in next few years, and in many cases will even exceed them. The ships are equipped with ballast water treatment system, heat recovery from central heating and air conditioning and system for cargo hold washing waters. Only energy efficient LED’s are used for lighting. The hull is painted with environmentally friendly and energy efficiency improving Ecospeed-paint. 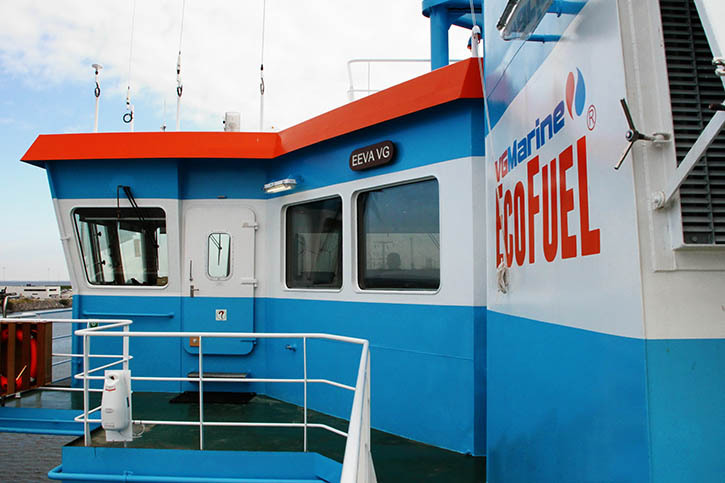 Ecospeed: An energy efficient coating for an energy efficient vessel. These vessels were designed with a substantial reduction of fuel consumption as well as emissions in mind. It was therefore essential that they were protected with a long lasting hull coating system that would help the owners to achieve their ecological goals instead of working against them. Ecospeed, produced by Subsea Industries (Belgium), is a 100%environmentally safe underwater ship hull coating system which provides the vessel with long-term protection and improves the ship’s performance. “This is a very important benefit for a company like the Meriaura Group that clearly take their ecological responsibilities seriously and try to make a difference”, says Ismo Saaros. It consists of a unique, entirely original and thoroughly proven system that combines the advantages of an easy-to-apply, superior hard coating, a surface treatment for hydrodynamic optimization and a long term underwater maintenance service system. Ecospeed offers a TBT-free, copper-free and biocide-free solution for the protection of the underwater hull. The Ecospeed coating contains a high concentration of embedded glass platelets. It has a very low amount of volatile organic compounds (VOC) and is typically applied in two coats of 500 µm dft. The high film thickness and the presence of glass platelets which act as an impermeable barrier explain why Ecospeed has excellent anti-corrosive properties. It is extremely durable, making it perfectly suited to be subjected to regular in-water surface treatment. One of the many unique factors of this underwater hull coating system is that with repeated underwater hull cleaning, the coating’s surface aspect does not degrade but gradually improves. This procedure is made easy by the coating’s technical properties. Cleaning can be carried out whenever needed, at any point in its lifespan, without causing damage. Ecospeed comes with a 10 year guarantee and is expected to last the lifetime of the vessel. This is in strong contrast to traditional anti-fouling paints where a new application is necessary during each drydocking.